Following the huge success of Len Bentley's escorted tour of AD's ground over 100 years ago the 6th page of those bygone eras are presented for you here. 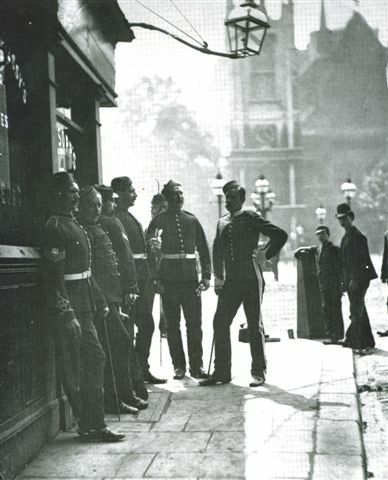 I have known this photograph for a long time, the book in which I first saw it described the scene as 'soldiers waiting on a Westminster street corner' and went on to speculate that they may have been in London for a special occasion. I thought at first that the tower in the background was Westminster Abbey, but I couldn't quite fit the street corner into the area surrounding the Abbey. 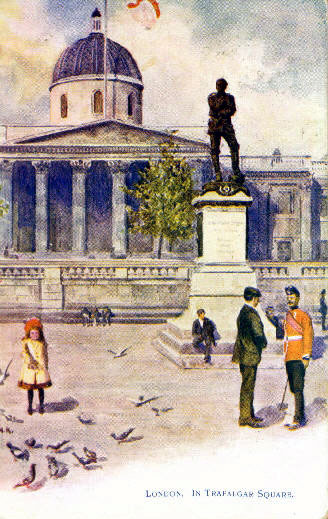 In fact the tower is that of St. Margaret's Church, the soldiers are recruiting sergeants and they are standing on the corner of King Street junction with Great George street outside The Mitre and Dove Public House waiting for opening time. Whenever I looked at the photograph of the long dead soldiers I wished that I could find out who they were, little did I know until later that this photograph, taken in 1877 was fully documented and had been taken to illustrate a series of articles which were one of the first attempts at photo journalism. In 1877 Aldophe Smith and John Thomson joined forces to produce a partwork which was published bi-weekly, the thirty seven parts could then be bound into a book. a photograph and a written article to accompany it. Thomson took the photographs and Smith wrote the articles. They included stories about a convicts home run by an ex Metropolitan Police Officer, a Temperance sweep and Italian street musicians. 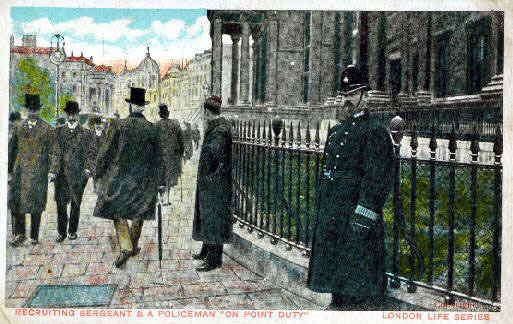 The recruiting Sergeants were a common sight in Westminster until 1909 when other less direct methods of recruitment were implemented. Although most of the recruitment was for infantry regiments, the recruiting sergeants were invariably cavalrymen; it probably had something to do with the attractive uniform. and the senior recruiting Sergeant circa 1877, Sergeant Ison of the 6th Dragoon Guards ( Carabineers ). The bearded Police Officer standing behind the group is PC Cox who was stationed at King Street Police Station, the Divisional station of 'A' Division before Cannon Row was built. The shoe blacks on the corner were probably boys from the ragged school in Old Pye street. The ragged schools encouraged boys into shoe black brigades which had been started in the early 1850s in an attempt to give boys gainful employment. Each area of central London had its own brigade and its members wore different coloured jackets, these boys would be wearing red jackets. Unfortunately the boys names were not recorded. 1953 when it was moved to Victoria Embankment Gardens outside the MOD building. sited in St. Martins Place where the Nurse Edith Cavell statue now stands. CLICK ON THE HELMET IMAGE FOR 'SIGNPOST ' (Express Navigation).